It’s been over a decade since Verne Harnish’s best-selling book Mastering the Rockefeller Habits was first released. Scaling Up (Rockefeller Habits 2.0) is the first major revision of this business classic which details practical tools and techniques for building an industry-dominating business. This book is written so everyone — from frontline employees to senior executives — can get aligned in contributing to the growth of a firm. 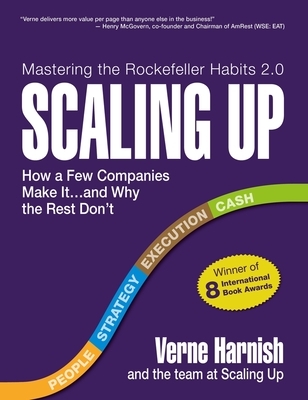 Scaling Up focuses on the four major decision areas every company must get right: People, Strategy, Execution, and Cash. The book includes a series of new one-page tools including the updated One-Page Strategic Plan and the Rockefeller Habits ChecklistTM, which more than 40,000 firms around the globe have used to scale their companies successfully — many to $10 million, $100 million, and $1 billion and beyond – while enjoying the climb! Verne Harnish is founder of the world-renowned Entrepreneurs' Organization (EO) and chaired for fifteen years EO's premiere CEO program, the "Birthing of Giants" and WEO's "Advanced Business" executive program both held at MIT. Founder and CEO of Gazelles, a global executive education and coaching company with over 150 coaching partners on six continents, Verne has spent the past three decades helping companies scale-up. The "Growth Guy" syndicated columnist, he's also the Venture columnist for FORTUNE magazine. He’s the author of Scaling Up (Rockefeller Habits 2.0); Mastering the Rockefeller Habits; and along with the editors of Fortune, authored "The Greatest Business Decisions of All Times", for which Jim Collins wrote the foreword. Verne also chairs FORTUNE Magazine's annual Leadership and Growth Summits and serves on several boards including chairman of The Riordan Clinic and the newly launched Geoversity. An investor in several scale-ups, Verne resides in Barcelona, Spain, with his wife and four children and enjoys piano, tennis, and magic as a card-carrying member of the International Brotherhood of Magicians.